My husband and I decided to try a 30-day "no sugar" challenge. 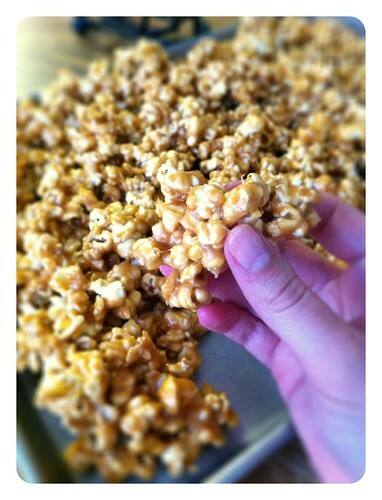 The night before we kicked the sugar habit, I made a big batch of Gooey Caramel Popcorn to get my last sugar fix. It definitely hit the spot, as it does every single time I make it. I reminds me of growing up in my parents' home and my sweet, next-door neighbor that would make this for us every Christmas. Once I got my hands on the recipe, though, there was no way I could wait until Christmastime to enjoy this gooey goodness. Now I make it every few months. Here is the recipe for you to enjoy as well! Pop popcorn, making sure to remove any kernels that didn't pop (your teeth will thank you later). Put in the biggest bowl you can find. Set aside. Pour caramel over popcorn, mix a bit, and then add almonds if desired. Continue mixing around until popcorn is thoroughly coated. Pour popcorn onto a cookie sheet sprayed with cooking spray, and allow to cool. Devour. I didn't know you had the recipe! I would've asked for it looong ago. I'm glad you posted this! I think I'm going to make this YUM!!! So I just pinned this. I didn't want to forget about it. I also think that I'm going to have my Activity days girls make this. THANK YOU FOR SHARING!!! !